For seasonable farm-to-table fare, we asked Chef Haidee Hart at British Columbia’s beautiful Stowel Lake Farm for recipes that are both hearty and relatively easy to make. 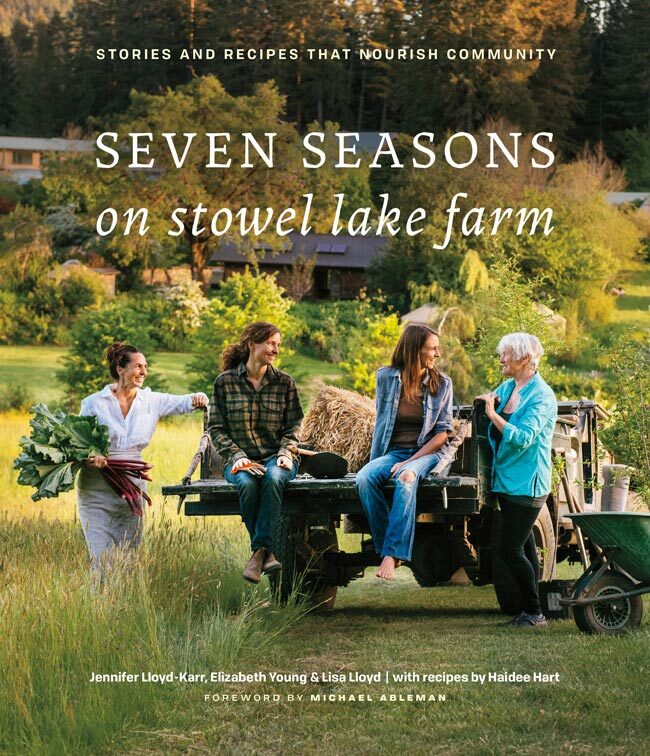 Each of these dishes from her book Seven Seasons on Stowel Lake Farm take little prep time and come together quickly for a nourishing and delicious celebratory dinner. Chef’s Notes: In the late fall on the farm we start embracing the hardier greens that overwinter here in our climate. We grow many different varieties of kale which can be combined or used interchangeably in most recipes. If the plants are well established enough in late summer, they can last all through the winter, and after the first few frosts the kale becomes sweeter and more flavourful. 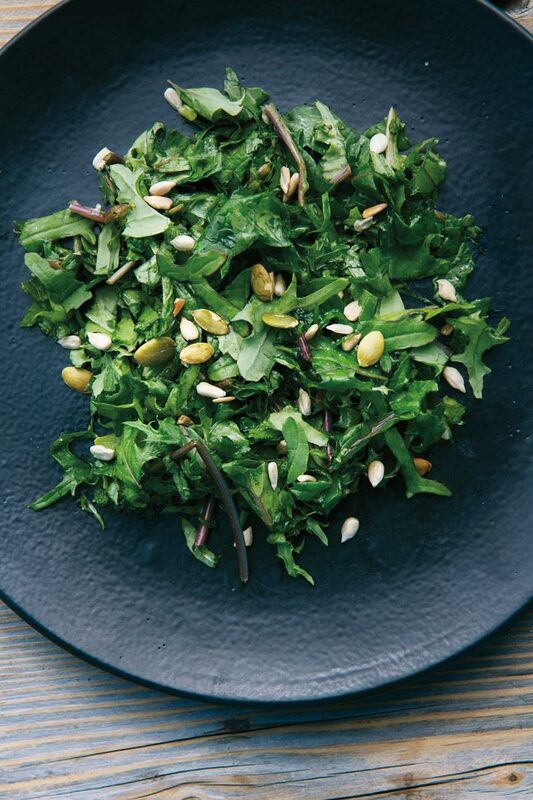 In this salad, massaging the kale with the acidic lemon juice or vinegar essentially cooks it while maintaining all of the nutrients—it becomes tender, and a really gorgeous dark green. My children eat huge bowlfuls of this salad. Bragg’s seasoning noted in the ingredients is gluten-free and I use it in place of soy sauce and tamari in most of my recipes. Wash kale and remove tough stems. Tear or chop kale finely and place in salad bowl. Mix together olive oil, lemon juice or vinegar, and tamari or Bragg’s. Pour dressing over kale, then massage into the kale, squeezing handfuls until the kale leaves start to wilt and darken in colour. Before serving, add toasted seeds and optional finely chopped apple or pear. 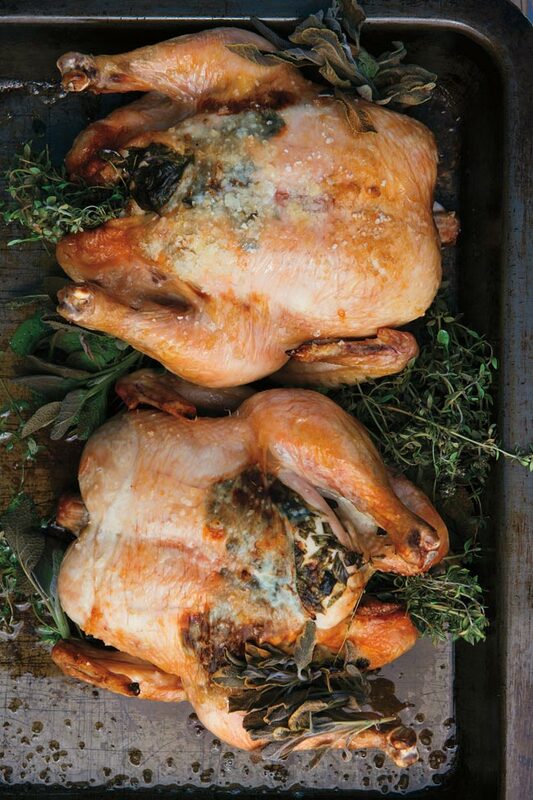 Roasting chicken can be easier and less stressful than turkey! For larger dinners we will sometimes roast two or three of these chickens in a nice big pan and there is always enough for everyone. The trick to keeping these birds moist and flavourful is to tuck a layer of fresh herb butter between the skin and the breast. The herbs are flexible; I list rosemary and tarragon here but feel free to try fresh thyme, oregano, sage or a combination of your favourites. I often serve this roasted chicken with basmati rice, crispy potatoes, braised kale, and green salad. Heat oven to 400°F. Rinse chicken and pat dry with paper towel. Mince fresh herbs and mix in small bowl with 4 tbsp butter. Place chicken in roasting pan. Carefully separate skin of chicken from the breast, starting above the open cavity of the chicken. This can be done gently with your hands or, if necessary, with a small paring knife. You just want to separate a few inches of the skin so that you can tuck the soft herb butter between the skin and the breast. It’s very important that the skin stays attached along the sides and isn’t taken right off. Gently tuck the herb butter in between the skin and breast, and rub the additional tablespoon of butter over the outside of the chicken. Sprinkle salt and pepper over the whole chicken and place in oven. Roast for approximately 1 hour, until golden brown and the temperature reaches 140°F when tested deep in the thigh area of the chicken with a meat thermometer. Remove chicken from oven and let rest for 10 to 15 minutes. I tent the chicken with foil and lay a tea towel over it to keep warm. This resting process allows the juices of the chicken to evenly distribute throughout the bird. To serve, I usually carve the chicken and set the pieces back into the roasting pan with the roasting juices. Heat oven to 400°F and butter a 9 x 12-inch baking dish. Thinly slice unpeeled potatoes in rounds. Peel, seed and thinly slice squash in large, half-moon pieces. Mince fresh thyme and set aside. 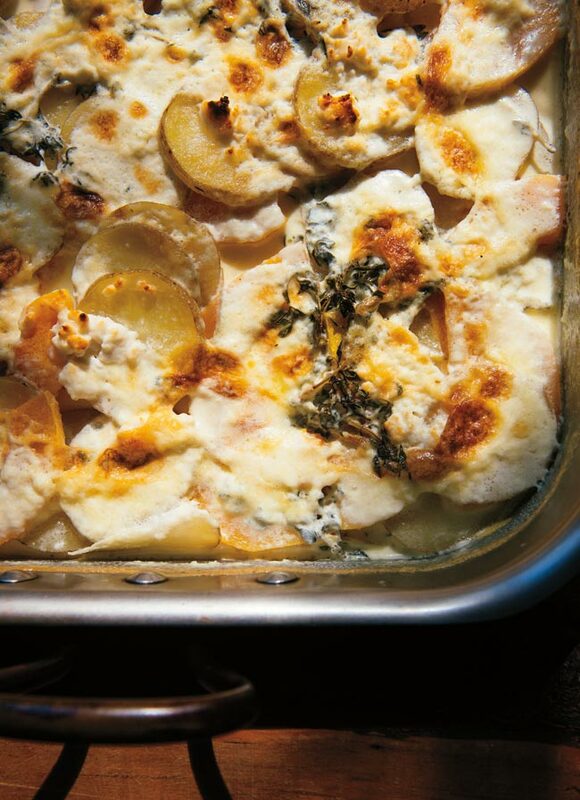 Layer potatoes and squash in baking dish. Pour heavy cream and sprinkle salt evenly over everything. Cream should reach to the top layer of the sliced potatoes and squash. Crumble cheese and sprinkle over squash and potatoes along with fresh thyme. Bake in oven for approximately 1 hour, until golden and bubbling and potatoes and squash are tender when pierced with a fork. In a large bowl, whip cream with icing sugar, cocoa and vanilla until thick and stiff. Refrigerate. Heat oven to 375°F. Line a 10  15-inch rimmed baking sheet with parchment paper. Prepare a clean tea towel by liberally dusting it with icing sugar—this will be for turning the cake out onto when it comes out of the oven. Set towel aside. To make the cake, use an electric mixer to beat egg yolks with 1/2 cup sugar until smooth and pale in colour. Mix in cocoa, vanilla and salt. In a separate bowl, whip egg whites until soft peaks start to form. Continue beating and slowly add 1/4 cup sugar, beating until the whites form stiff peaks. Add yolk mixture into whites and gently fold together. Spread batter into the pan and smooth it out so it is fairly flat. Bake for 12 to 15 minutes, or until cake springs back when lightly touched. Turn warm cake out onto the sugar-dusted tea towel and carefully remove parchment paper from the cake. Starting at its shorter edge, roll cake with the towel so that it cools while taking the shape of the log. (Be sure to roll a short log, rather than a long one!) Allow it to cool. To finish Unroll the cake and spread half of the chocolate cream on the cake. Roll cake up with filling inside. 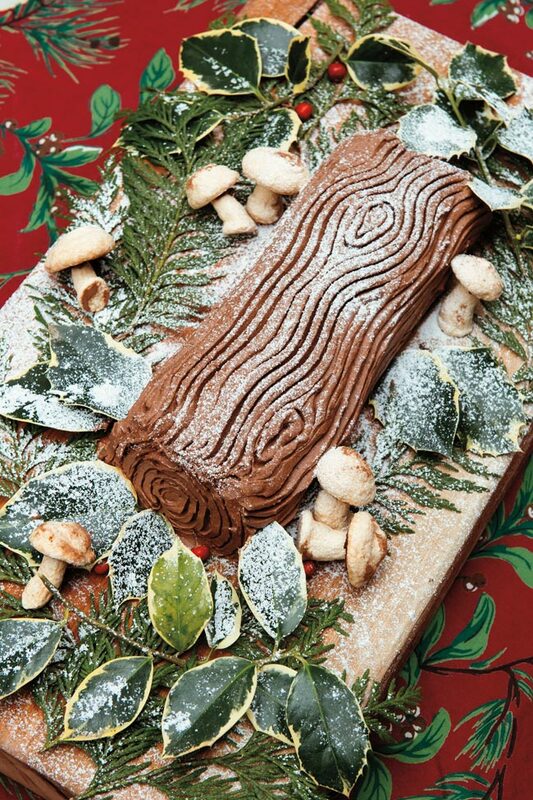 Place seam side down onto a platter and spread rest of the chocolate cream over the outside of the log. You can use a fork or other sharp tool to make bark-like lines on the cake. Refrigerate. 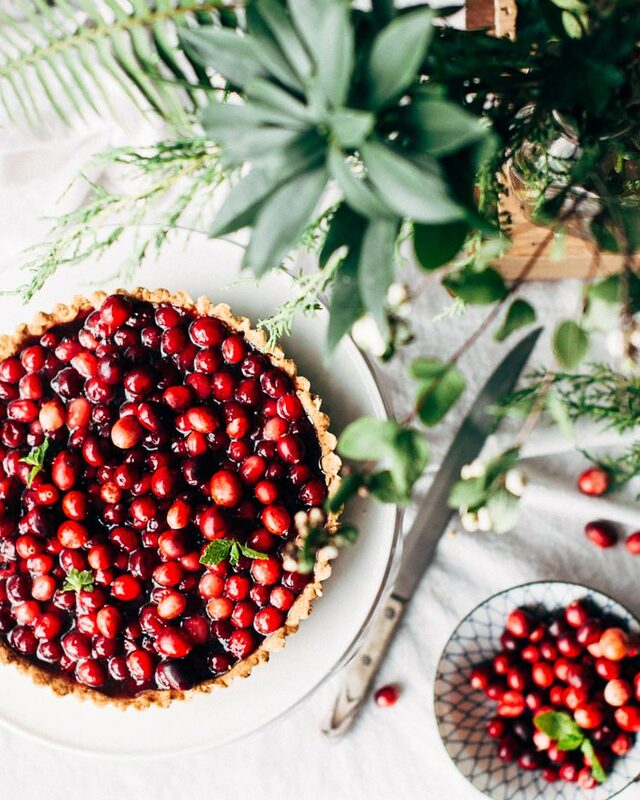 Just before serving, dust with powdered sugar and decorate with holly or other winter greenery. Tip: Make your dessert the day ahead, so you have plenty of time to focus on your savoury dishes. Excerpted with permission from Seven Seasons on Stowel Lake Farm by Lisa Lloyd, Jennifer Lloyd, Elizabeth Young, and Haidee Hart. Published by Page Two Books, © 2018. Available online and at your local bookstore.